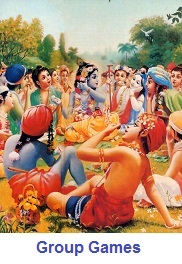 vyAsa and parAsara come home after school. They bring their friend aththuzhAi along with them. ANdAL pAtti: Who have you brought along? 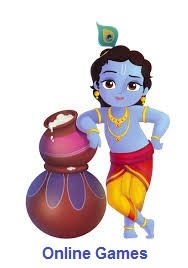 vyAsa: pAtti, this is aththuzhAi, our friend. We shared with her some of the vaibhavams you told us and she was interested in listening to them from you. So, we brought her along. ANdAL pAtti: Welcome aththuzhAi. Happy to hear that you both are not only listening to what I say, but also sharing it with your friends. parAsara: pAtti, we came to hear about our AchAryas. ANdAL pAtti: Good. Today I will tell you about our AchAryan, who brought back the glory of our sampradhAyam through divine intervention from nammAzhwAr. aththuzhAi: Who was it pAtti? ANdAL pAtti brings some fruits and eatables for aththuzhAi, vyAsa and parAsara. ANdAL pAtti: He is our very own nAthamunigaL. sriman nAthamunigaL was Born in veera nArAyaNa puram (kAttu mannAr kOyil) to Isvara bhattAzhwAr. 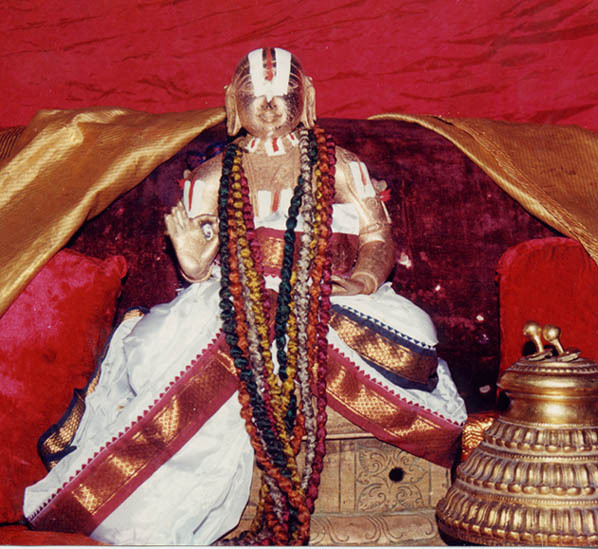 He is also known as srI ranganAtha muni and nAtha brahmar. He was an expert in ashtAnga yOgam and divine sangeetham. Also, he is the one who established the araiyar sEvai which is still observed in srIrangam, AzhwAr thirunagari, srivillipuththUr, etc. parAsara: We have seen araiyar sEvai in front of our perumAL many times pAtti. Its so beautiful the way the araiyar swamy sings the pAsurams with the thALam in his hands. ANdAL pAtti: Yes. One day, A group of srIvaishNavas from mElnAdu (thirunArAyaNapuram area) visit kAttu mannAr kOyil and sings the “ArAvamuthE…” padhigam (decad) from thiruvAimozhi in front of mannanAr (emperumAn in kAttu mannAr koil). nAthamunigaL, enthralled by the meanings of those pAsurams, asks the srIvaishNavas about them, but they dont know anything beyond those 11 pAsurams. They say that if nAthamunigaL goes to thirukkurugUr, he may be able to find out more details. nAthamunigaL takes leave from mannanAr and reaches AzhwAr thirunagari. aththuzhAi, vyAsa and parAsara finish their eatables soon and continue hearing about nAthamunigaL eagerly. ANdAL pAtti: He met parAngusa dhAsar who is a sishya of madhurakavi AzhwAr, who teaches kaNNinuN chiruththAmbu to nAthamunigaL and asks him to chant that 12000 times in front of thiruppuzhiyAzhwAr (tamarind tree where nammAzhwAr lived) on a single stretch. Since nAthamunigaL has already learnt ashtAnga yOgam, he meditates on nammAzhwAr and successfully completes chanting kaNNinuN chiruththAmbu 12000 times. nammAzhwAr being pleased with nAthamunigaL , appears in front of him and blesses him with full knowledge in ashtAnga yOgam, 4000 divya prabhandham and all meanings of aruLichcheyal (dhivya prabandham). vyAsa: So, is ‘ArAvamuthE’ padhigam, a part of 4000 dhivya prabandham? ANdAL pAtti: Yes. 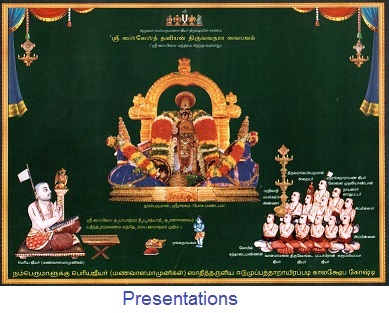 ArAvamuthE padhigam is about thirukkudanthai ArAvamuthan emperumAn. After that, nAthamunigaL returns to kAttu mannAr kOyil and presents the 4000 dhivya prabhandham in front of mannanAr. mannanAr is very pleased with nAthamunigaL and asks him to categorize dhivya prabhandham and propagate it everywhere. He adds music to aruLichcheyal and teaches the same to his nephews kIzhai agaththAzhwAn and mElai agaththAzhwAn and propagates the same through them. Not only that, through his ashtAnga yOga sidhdhi, he foresaw the appearance of another great AchAryan of our sampradhAyam. Next time around, I will tell you more about him. Children in chorus: Sure pAtti. We are eager to hear about it. aththuzhAi takes blessing from ANdAL pAtti and leaves to her house, while vyAsa and parAsara go to study their school lessons. This entry was posted in Beginner's guide, Stories on June 15, 2015 by Sarathy Thothathri. parAsara and vyAsa come and see ANdAL pAtti after a while. They had gone to thiruvallikkENi to be with their grand parents during vacation. ANdAL pAtti: parAsara! vyAsa! Welcome back. I hope you had a great time at thiruvallikkENi. parAsara: Yes pAtti! It was wonderful there. We went to pArthasArathy perumAL temple everyday. Not only that, we also visited many near-by dhivya dhEsams such kAnchIpuram, etc. We also went to srIperumbUthUr and worshiped emperumAnAr. ANdAL pAtti: Very nice to hear. srIperumbUthUr is the birth place of rAmAnujar. He is one of the most important AchAryas. I will tell more about him soon. I told you last time that I will tell you about AchAryas. I will give a brief introduction now. Do you know the meaning of the word “AchArya”? vyAsa: pAtti! Is AchArya the same as guru? ANdAL pAtti: Yes. AchArya and guru are similar terms. AchArya means one who is learned in true knowledge, practices it himself and teaches/inspires others to follow the same. guru means one who removes our ignorance. parAsara: What is “true knowledge” pAtti? ANdAL pAtti: Very intelligent question parAsara. True knowledge is knowing who we are and what are responsibilities are. For example, I am your grandmother and my responsibility is to educate you with good values, etc. If I have a good understanding about this – that is true knowledge. Similarly, all of us are sub-servient to bhagavAn and He is our master. As a master, he deserves to be served by us and as a dependent, it is our duty to serve him. This is the common “true knowledge” for every one to understand. Those who know this and teach to others through practical ways are called AchAryas. This “true knowledge” is available in vEdham, vEdhAntham, dhivya prabandham, etc. vyAsa: Oh! So, who is the first AchArya? Some one should know about this “true knowledge” first to have taught to others. ANdAL pAtti: Brilliant question vyAsa. 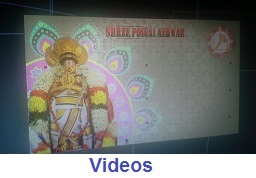 Our periya perumAL is the first AchArya. We have already seen about AzhwArs. perumAL gave them the true knowledge. AzhwArs showed great attachment towards perumAL as we have already seen in their lives and also revealed the true knowledge through their dhivya prabandhams. parAsara: pAtti! after AzhwArs’ time, what happened? ANdAL pAtti: AzhwArs stayed in this world for some time and they left to paramapadham to be with perumAL eternally there. There was a dark period when the knowledge slowly deteriorated and even the dhivya prabandhams were almost lost. But it was by the divine grace of nammAzhwAr, we got the dhivya prabandhams back and was propagated by many AchAryas subsequently. We will see about those AchAryas subsequently. 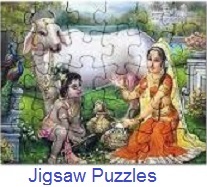 parAsara and vyAsa: We are looking forward to it pAtti. ANdAL pAtti: Well, your parents are calling you now. I will tell more about the AchAryas when we meet next time. This entry was posted in Beginner's guide, Stories on June 11, 2015 by Sarathy Thothathri.